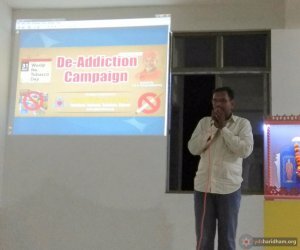 On account of “World Tobacco Prohibition Day”, Yogi Divine Society had organized a public meeting on Tuesday, the 13th June 2017 in Atmiya Vihar, 2nd floor, above Chola Institute, Bus Stand Rd. 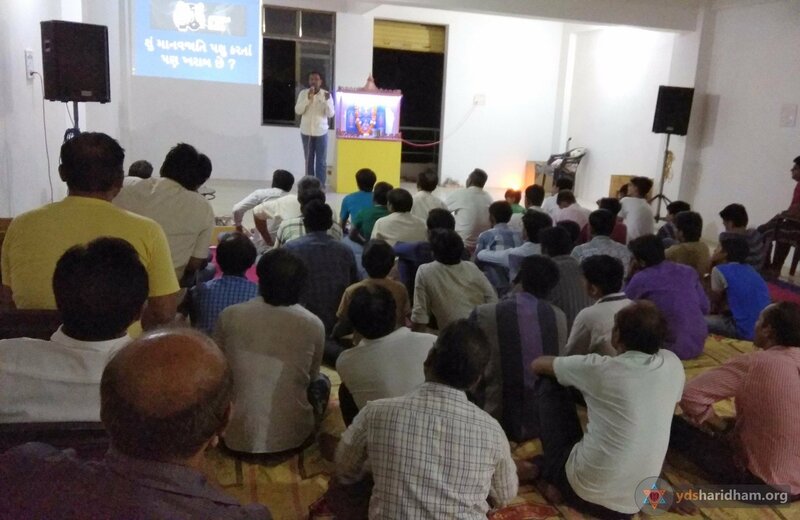 in Keshod in which, around 60 ladies and gents had participated and known about the deadly effects of tobacco. The addiction and enormous use of tobacco and its poisonous products causes death of lakhs of people and young children every year in the world. Keeping this point before the eyes, Yogi Divine Society had organized this meeting in which, through the power point presentation, the volunteer of the institution Sri Umeshbhai Hingrajiya had informed about the negative effects of use of tobacco on human body while also informing as to how the pregnant women and young children also suffer from the diseases of lungs and respiratory system being the victims of smoking by other people in the public places and at homes. Having known about the deadly effects of use/consumption of tobacco, gutka, bidi, cigarettes etc. 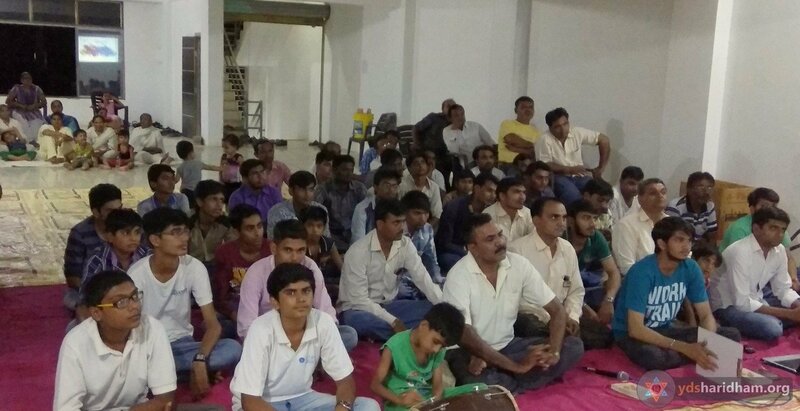 in this meeting, the addicts of the same had resolved to give them up and also to spread these information to others in the society and to alert them in the matter. The socio-political leaders of the society like Sri Mansukhbhai Ghodasar, Ashokbhai Maru and Vallabhbhai Ghodasar who were also present in the meeting had all highly appreciated this program and had shown their hearty willingness/readiness to fully cooperate in this mission of the institution. d„Nmhpf, sp.13-06-2017“p fp¡S> rhð sdpLy$ r“j¡^ qv$hk“¡ A“ygnu“¡ ep¡Nu qX$hpB“ kp¡kpeV$u Üpfp L¡$ip¡v$ dyL$pd¡, ApÐdue rhlpf, buÅ dpm¡, Qp¡gp BÞkV$uV$éyV$“u D‘f, bk õV¡$ÞX$ fp¡X$ Mps¡ A¡L$ kcp“y„ Apep¡S>“ L$fhpdp„ Apìey„ lsy„. S>¡dp„ 60 S>¡V$gp cpBAp¡, bl¡“p¡A¡ cpN gB sdpLy$“u rhOpsL$ Akfp¡ rhi¡ ÅZL$pfu d¡mhu lsu. sdpLy$ A“¡ sdpLy$“u b“phV$p¡“p¡ rhðdp„ dp¡V$p ‘pe¡ D‘ep¡N ’pe R>¡. Ap T¡fu b“phV$p¡“y„ ìek“ kpdpÞe “pNfuL$p¡“¡ A“¡ Ly$dmu he“p bpmL$p¡“¡ ’sp„, rhðcfdp„ v$f hj£ gpMp¡ gp¡L$p¡ d©Ðey ‘pd¡ R>¡. Ap bpbs“¡ gÿedp„ fpMu“¡ ep¡Nu qX$hpB“ kp¡kpeV$u Üpfp Ap kcp“y„ Apep¡S>“ L$fhpdp„ Apìey„ lsy„. Ap kcpdp„ ‘phf ‘p¡BÞV$ â¡TÞV¡$i““p dpÝed’u gpc Ap‘sp„ k„õ’p“p L$pe®L$sp® îu Dd¡icpB tlNfpÆepA¡ sdpLy$“p k¡h“’u ìe[¼s“p ifuf ‘f ’su “L$pfpÐdL$ Akfp¡ rhi¡ dprlsu Ap‘u lsu. kp’p¡kp’ bpmL$p¡ A“¡ kNcp® õÓuAp¡ ‘Z Ål¡f õ’m¡ A’hp Ofdp„ AÞe ‘yfyjp¡ Üpfp ’sp„ ^yd°‘p““p riL$pf b“u“¡ a¡akp„ A“¡ ðk“s„Ó“u rbdpfuAp¡’u r‘X$pe R>¡ s¡“u rhõs©s R>ZphV$ L$fu lsu. kcp“p dpÝed’u sdpLy$, NyV$L$p, buX$u, kuNpf¡V$ hN¡f¡“u OpsL$ Akfp¡ rhi¡ ÅZu kcpdp„ D‘rõ’s gp¡L$p¡ ‘¥L$u ìek“p¡’u r‘qX$s gp¡L$p¡A¡ s¡“p¡ ÐepN L$fhp“p¡ r“Z®e L$ep£ lsp¡. kp’p¡kp’ lpS>f gp¡L$p¡A¡ Ap dprlsu kdpS>dp„ a¡gphu AÞe gp¡L$p¡ ky^u ‘lp¢QpX$u s¡d“¡ ÅN©s L$fhp“p¡ r“^p®f L$ep£ lsp¡. Ap kcpdp„ îu d“kyMcpB Op¡X$pkfp, Aip¡L$cpB dpê$ s’p h‰ccpB Op¡X$pkfp S>¡hp fpS>L$ue kpdpÆL$ AN°ZuAp¡ D‘[õ’s füp„ lsp„. s¡dZ¡ ‘Z k„õ’p“p Ap âepk“¡ rbfv$phhp“u kp’p¡kp’ ‘fp¡‘L$pf“p Ap L$pe®dp„ klL$pf Ap‘hp“u sÐ‘fsp v$ip®hu lsu.